RONKONKOMA, NY--(Marketwired - Dec 14, 2017) - Sigma Corporation of America, a leading still photo and cinema lens, camera, flash and accessory manufacturer, today announced the return of its unprecedented holiday sale on the award-winning Sigma Global Vision Art lens line. The wildly popular holiday sale, which is the largest in the company history, offers customers savings up to $100.00 USD on sought after Sigma Art lens models for a limited time. The savings are only available through Sigma's authorized US dealers beginning Thursday, December 14th through Monday, December 25th 2017. Sigma's award-winning Global Vision Art lenses are defined by their edge-to-edge, uncompromising image quality. Best-in-class optics combined with outstanding craftsmanship give photographers a lens that enables the ultimate in artistic expression. The award-winning Art line of large-aperture primes, wide angles and standard zooms captures portraits, fashion, architecture, landscapes and more with groundbreaking sharpness and clarity. 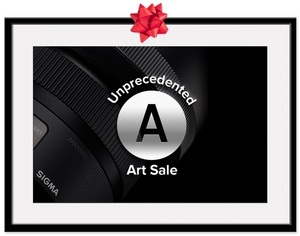 Shop round 2 of Sigma's Unprecedented Art Sale - back by popular demand!